DANG! In the course of one week I visited two of about the most culturally opposite places in the country... Talladega, Alabama on a NASCAR race weekend and San Francisco, California for a blogger festival that promoted organic and sustainable foods. Screw sustaining things for now... Boogity! Boogity! Boogity! Let's go racin' boys!!! Eusebio and I had the privilege of taking a Sunday out of our schedules to make a 24 hour trip to Talladega for the Fall Sprint Cup race. We drove overnight to Alabama, arriving at the track around 4 a.m. in a fog thicker than Dale Earnhardt Jr.'s Southern accent. We took a nap in the truck until the sun came up then cracked open a couple ice cold Budweisers just to make everything right with the world. Soon it was time to walk to the track, so, with ice chest and beers in hand, we began our journey through the Superspeedway maze of glory. 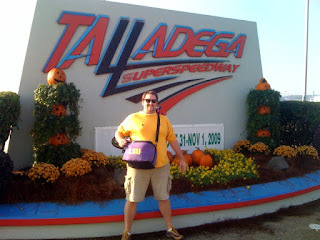 Talladega, in all of its awesomeness, filled the air with joy, celebration, and redneck perfume, which is a mixture of combusted fuel exhaust, sweet barbeque smoke, and cheap beer induced urine. It is the smell of excellence. Eusebio and I made our way to the promotional area where trailers can be found vending merchandise of all the popular drivers to their legions of fans. There were also exhibits to promote products, show off drifting techniques in Dodge cars, and even sign up to join the U.S. Army! 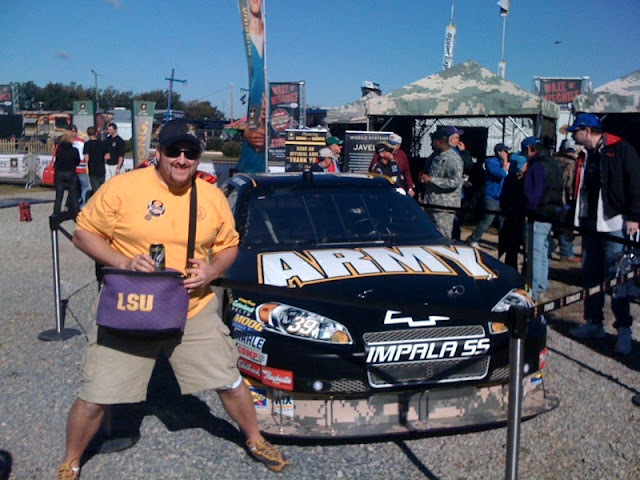 I Took a Picture with the #39 Ryan Newman U.S. Army Chevy Impala because Ryan Newman is my boy! 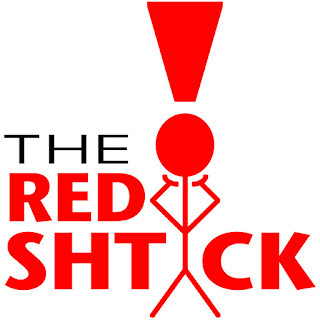 Alas, this here is a food and drink blog, not a NASCAR hootananny, so let's eat! 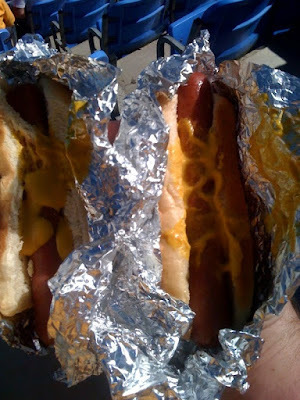 Before getting to our seats in the grandstands, I picked up a handfull of hotdogs for me and Eusebio. Some unknown meats on an enriched flour bun with a "squirt" of yellow mustard sure hit the spot! I don't seem to a have picture of the beer, but rest assured they were consumed in mass quantities. If I remember correctly, which oddly enough I do, we each drank a mixture 14 ice cold Budweisers and black and gold (representing the Saints, but I also know they matched the black and gold of th #39 US Army Chevrolet) Bud Lights. They tasted delicious amidst the carbon monoxide fumes that filled the air from the race track below. We really couldn't have asked for a prettier day. I mean, look at that picture below! 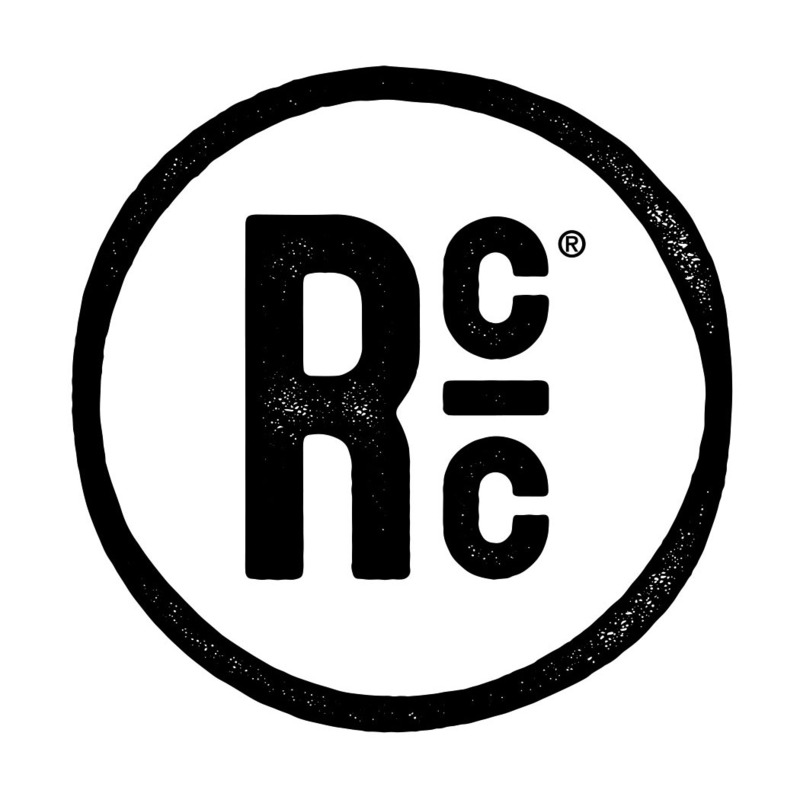 During the course of events in a 500 mile race and 14 refreshing cans of macro-brewed swill, one is bound to eat more than just a couple of mustard-drenched wieners on a bun. Leave it to Eusebio to find something a little more interesting for the palate. Behold the Taladega pulled pork sandwich! 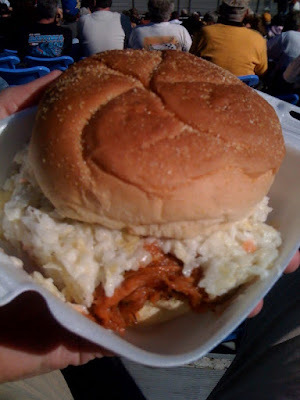 The pulled pork sandwich made me happy while I was upset that I couldn't even see Ryan Newman's wreck (click here to watch the highlight with French broadcasters... hilarious) because it happened on the other side of the track. No worries though, I had a belly full of beer and pork and we were going to a green-white-checker finish! The slaw seemed a bit excessive to me and I pulled some out, but the pork was actually quite edible. 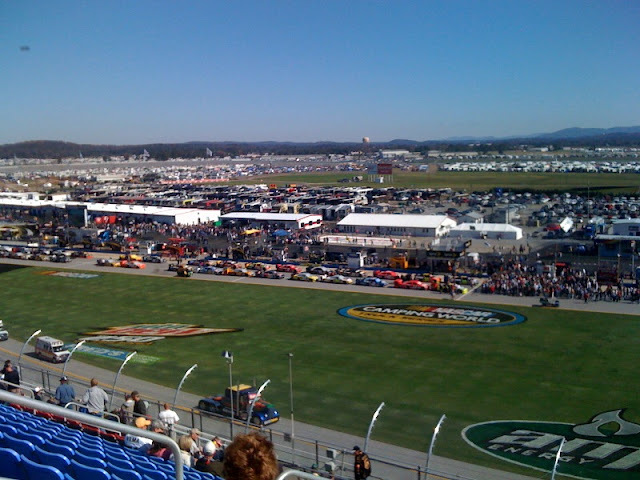 Talladega made me miss my three consecutive years of going to Bristol for the Spring race. I'll be back for sure. As much as I joke and make fun, I really do love NASCAR races. They are always a great time and they let you bring your own beer and food into the track. What other major sporting league can say that?! After the race Eusebio and I found a shortcut through the pastures of people and vehicles to get back to my truck. We climbed in and set off to the West where were hoping to find something to eat for dinner and eventually our home in Louisiana. We had to be at work the next day and being in Alabama wasn't going to help that situation! Unfortunately, in order to get home we had to drive through Hell... I mean Tuscaloosa. 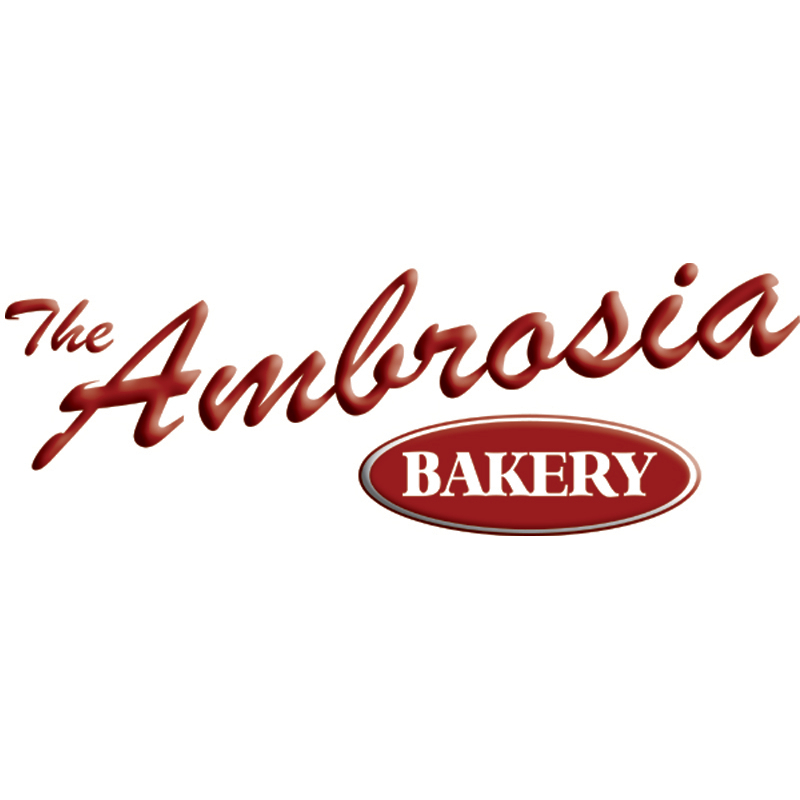 It was there that I ate one of the most disappointing burgers of my life, and certainly the worst since the River Queen Drive Inn. For that, you'll have to check back for the next post. The checkered flag is waving... I'm out!